Seventh-ranked Kaspiy Aktau (1-19) gave a tough game to second ranked Tobol (13-7) in Kostanay on Sunday. Tobol managed to secure only three-point victory 92-89. However their fans expected much easier game. Tobol have an impressive series of seven victories in a row. They maintain second place with 13-7 record having nine points less than leader Astana. Kaspiy Aktau lost sixth consecutive game. They stay dead last with 19 lost games. Tobol will have a break next round, and it should allow them to practice more before next game. Kaspiy Aktau will play at home against Barsy 2 (#6) and it may be a tough game between close rivals. Fifth ranked Sinegorie K. (8-11) crushed at home 6th ranked Barsy 2 (4-18) by 45 points 104-59, which is the biggest margin this round. Newly promoted Sinegorie K. maintains fifth place with 8-11 record. Barsy 2 lost their thirteenth game in a row. Barsy 2 at the other side, also newcomer in the league, keeps the sixth position with 18 games lost. Sinegorie K. will play against higher ranked Almat.Legion (#3) in Alma-Ata in the next round and it will be quite challenging to get another victory. Barsy 2 will play on the road against Kaspiy Aktau and it may be a tough game between close rivals. There were no shocking results in the rest of the games of round 13: bottom-ranked Kaspiy Aktau lost to Tobol on the opponent's court 83-101. Almat.Legion outscored Barsy 2 in a home game 102-76. Barsy 2 was rolled over Almat.Legion on the road 78-112. Sinegorie K. defeated Barsy 2 on its own court 66-60. Very expected game in Kostanay where 7th ranked Kaspiy Aktau (1-19) was defeated by second ranked Tobol (13-7) 101-83. 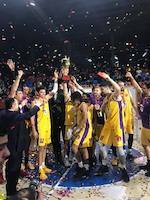 The victory was the seventh consecutive win for Tobol. 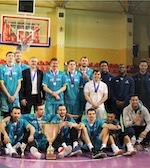 They maintain second place with 13-7 record having nine points less than leader Astana. Kaspiy Aktau lost their sixth game in a row. They stay dead last with 19 lost games. Tobol will have a break next round, and it should allow them to practice more before next game. Kaspiy Aktau will play at home against Barsy 2 (#6) and it may be a tough game between close rivals. Rather predictable result in Alma-Ata where fourth ranked Almat.Legion (11-7) smashed 6th ranked Barsy 2 (4-18) 102-76. Almat.Legion moved-up to third place, which they share with Barsy Atyrau. Barsy 2 lost their thirteenth game in a row. Barsy 2 at the other side, also newcomer in the league, keeps the sixth position with 18 games lost. Almat.Legion will play against Sinegorie K. (#5) in Kokshetay in the next round. Barsy 2 will play on the road against Kaspiy Aktau and it may be a tough game between close rivals. Not a big story in a game in Alma-Ata where 6th ranked Barsy 2 (4-18) was rolled over by fourth ranked Almat.Legion (11-7) 112-78. Almat.Legion moved-up to third place, which they share with Barsy Atyrau. Barsy 2 lost their thirteenth game in a row. Barsy 2 at the other side, also newcomer in the league, keeps the sixth position with 18 games lost. Almat.Legion will play against Sinegorie K. (#5) in Kokshetay in the next round. Barsy 2 will play on the road against Kaspiy Aktau and it may be a tough game between close rivals. The game between closely ranked teams ended with fifth ranked Sinegorie K.'s (8-11) home victory over 6th ranked Barsy 2 (4-18) 66-60. Newly promoted Sinegorie K. maintains fifth place with 8-11 record. Barsy 2 lost their thirteenth game in a row. Barsy 2 at the other side, also newcomer in the league, keeps the sixth position with 18 games lost. Sinegorie K. will play against higher ranked Almat.Legion (#3) in Alma-Ata in the next round and it will be quite challenging to get another victory. Barsy 2 will play on the road against Kaspiy Aktau and it may be a tough game between close rivals.